After stuffing myself full of tacos for the past few weeks, I’m over South American food, and believe I’ve found my new go-to hangout for quick bites in Soho. Last Tuesday was the Grand Opening of La Cabane a Vin, a charming, rustic and well-situated bar/bistro on Hollywood Road. The interior design, done by Elsa Jean de Dieu and Eunice Cheung from Effect, features exposed brick walls, wooden slats that resemble those used to make wine crates, swing chairs suspended from the ceiling, a small temperature-controlled cellar tucked away next to the bar, and all the small touches that make this place a really comfortable and unpretentious place to go for a drink and a (few) snack(s), a light dinner, or even a midnight snack. 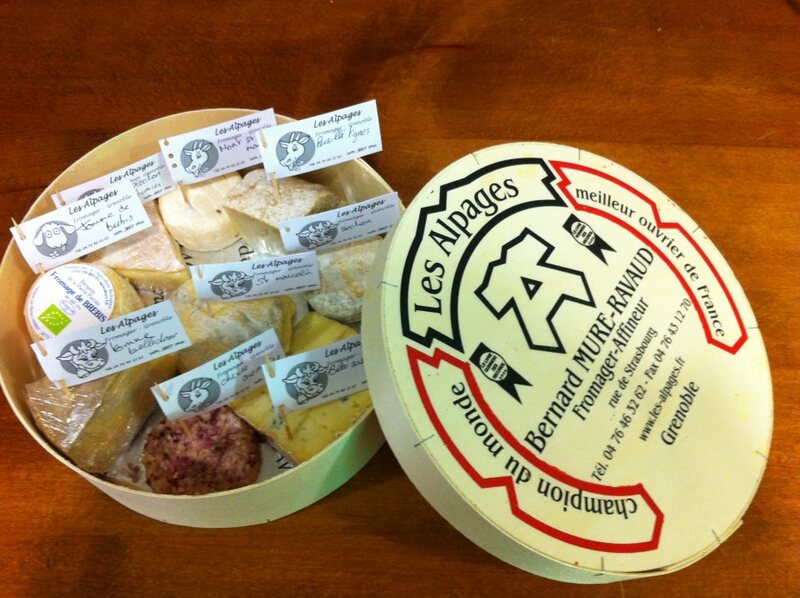 The local chefs, after some rigorous training, do a good job with the bistro dishes, and the rillettes and terrine are made in house. 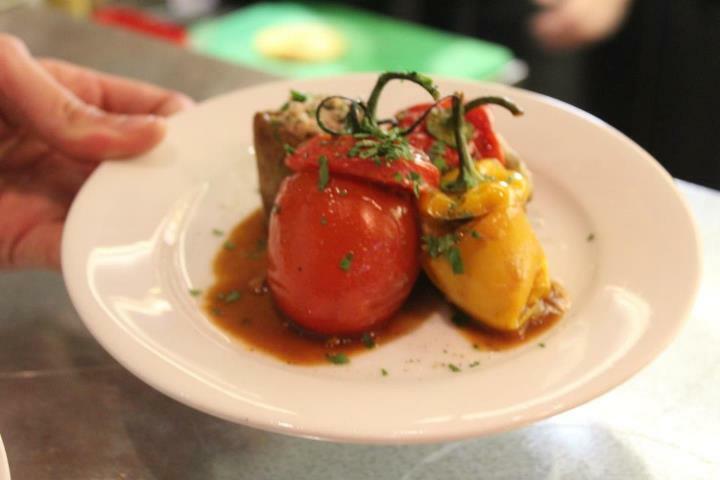 The food is authentic, and everything is served in small plates so that one can choose to make a meal of it, or to just order a couple of dishes to accompany a bottle of wine. There are so many fake French bistros in Hong Kong (the worst of which has to be Brasserie de L’île), and it’s nice to see one that is doing it right! They are still tweaking the recipes a bit, and are tireless trying to source the freshesh and tastiest ingredients. 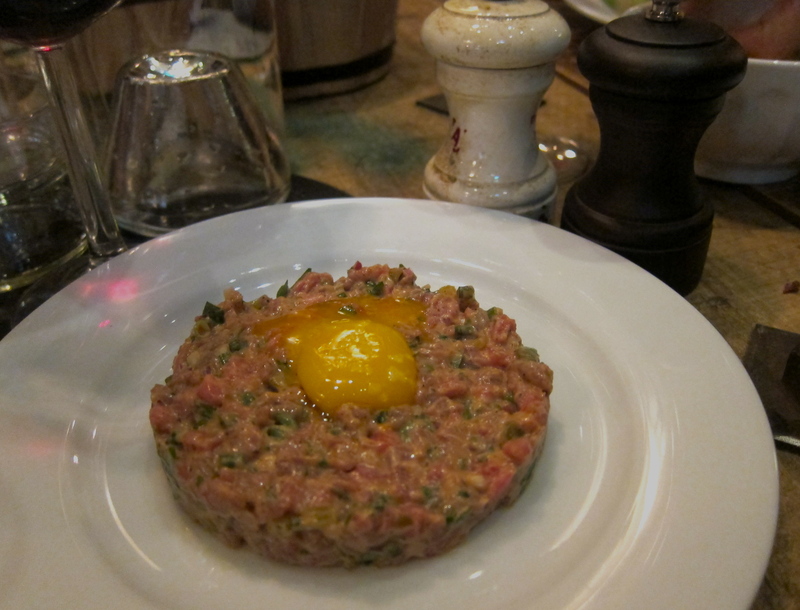 La Cabane has tried to use organic produce from local HK farms as much as they can, but have mentioned that the quality is not always consistent; many of their ingredients are sourced from France. You also have the opportunity to try all of their wines, it’s a huge selection, with some original names, and honestly priced. By that I mean well-priced, with bottles starting from the $200s. 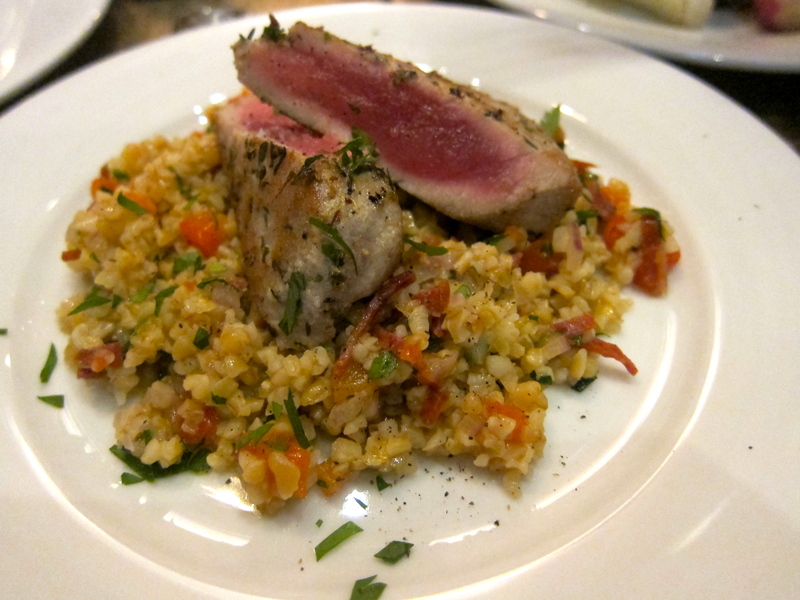 This is a wonderful dish, the tuna is perfectly seared and cooked, and bulgur accompaniment is a taste explosion. I did notice that the bulgur was different the second time I tried it, slightly more wet, and a bit too heavily salted. It is forgivable to have small inconsistencies in their first week, and I reckon I will continue to order it every time I go. 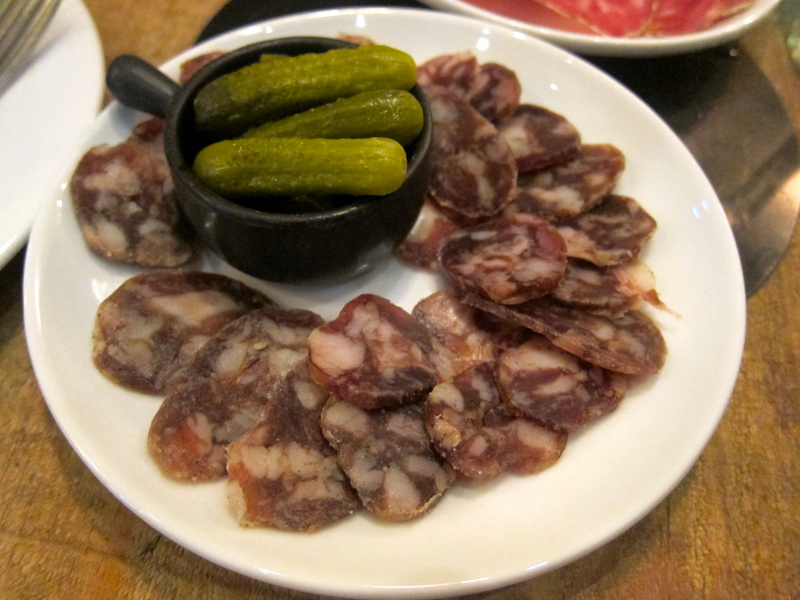 This is the first time in my life that I have tried a blood sausage – for some reason, the idea of congealed pigs blood never appealed to me!! 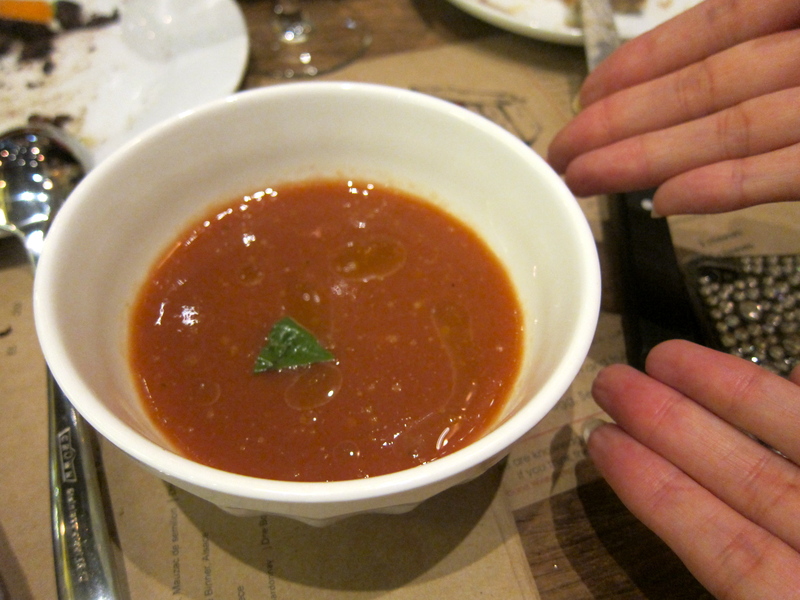 But I tried it, and it was…good…much better than I ever expected…and I ate quite a bit of it. 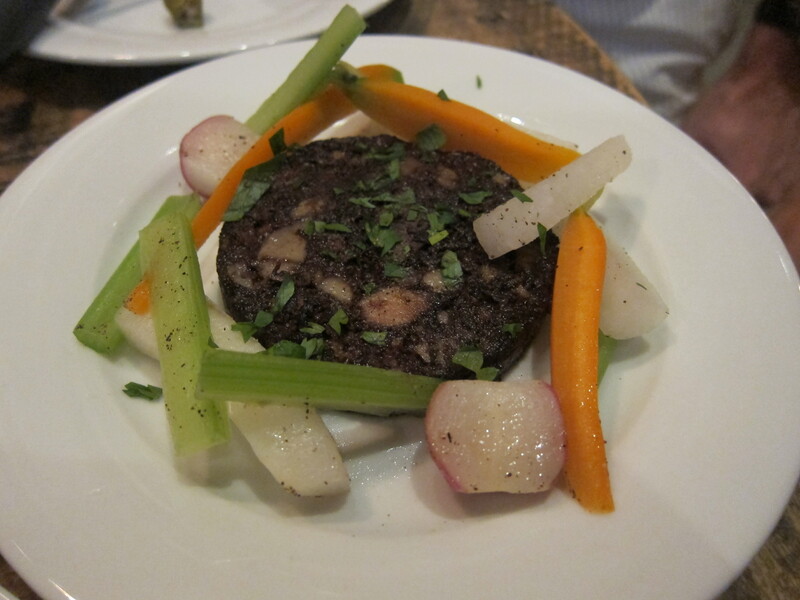 Fancy that, pigs blood doesn’t taste so bad after all…I feel like I had a food epiphany! 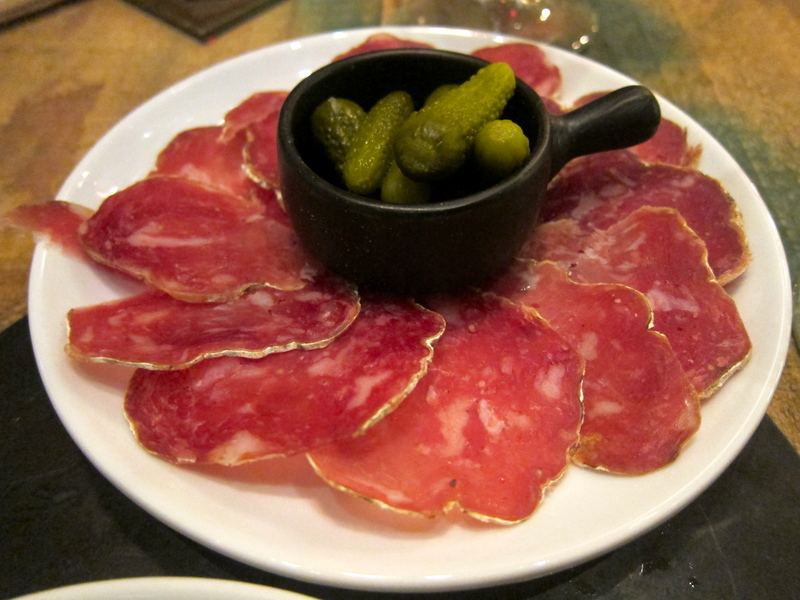 The kitchen is usually open until 11pm, but the charcuterie and cheeses are available until closing time. 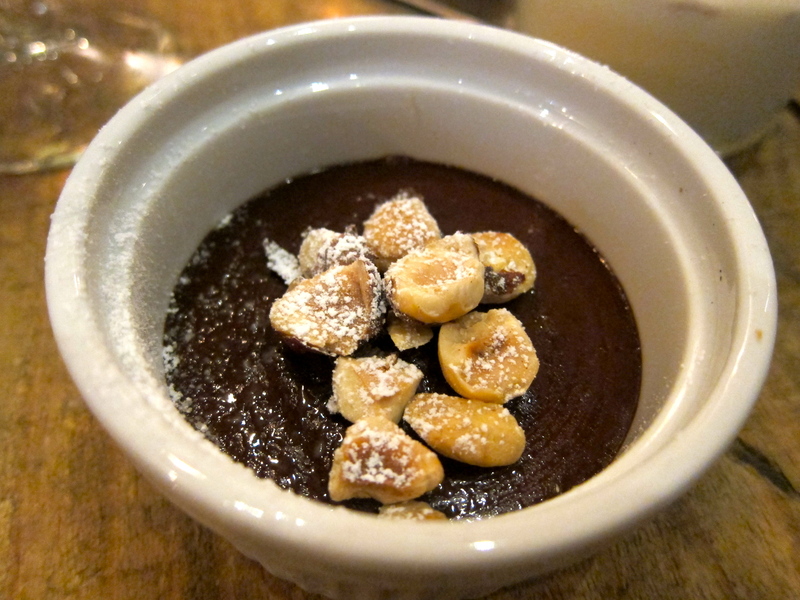 We’ve tried two of the four desserts so far – the chocolate pot had a satisfying bitter flavour and the addition of roasted hazelnuts was a nice contrast in texture, but the pot needs to be taken out of the fridge a bit earlier as it was a tad on the hard side. 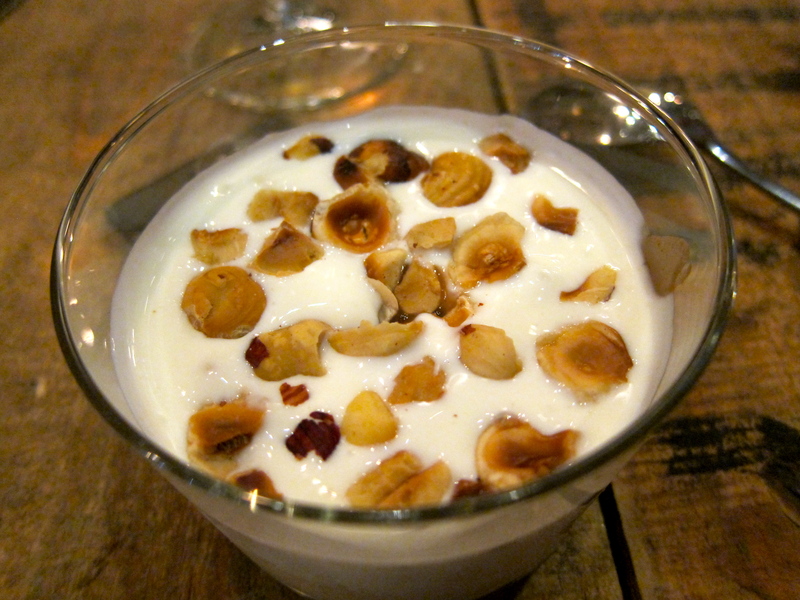 The fromage blanc was heavenly, resembling a fresh yoghurt that is just tart enough to balance the sweet chestnut cream nestled in the bottom on the pot. I could easily eat this for breakfast too! 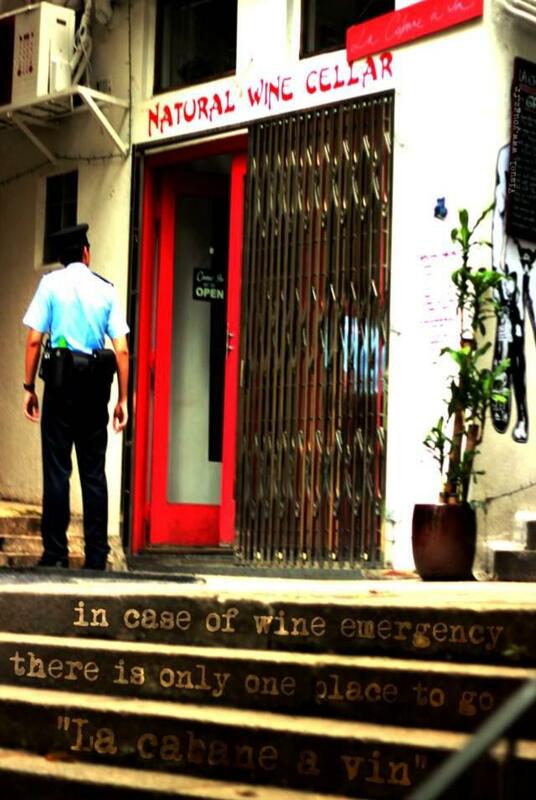 In addition to the bistro, the owners and collaborators, a group of French natural wine lovers, started by opening La Cabane a Vin Cellar – Hong Kong’s first all-natural wine shop. They source only natural wines from France, Italy, Spain and Greece. Their purchasing philosophy is simple – they only purchase wines that they like. The cellar/shop is located under the steps further down Hollywood Road, and stocks a huge selection of wines in their temperature controlled cellar. Cristobal, Adrien and Alban move between the shop and the bistro, are happy to talk to you and explain the concept behind the wines. As I have gathered so far, there are many wines on the market which are “organic” or are labelled as using only “organic grapes”, but this doesn’t necessarily mean that the vinification process (the fermentation process that takes the grapes from the field to the bottle) is organic too – they still add sulfites to preserve the wine. The wines at La Cabane are NATURAL: the difference is that not only are the grapes organic, but the processes are “organic” too. They are sourced from small vineyards, often the grapes are hand-picked and wines are produced in small quantities. An added benefit – they reckon that it’s the sulfites in wine that give you a hangover. No sulfites – no hangover! I’m not sure how much truth there is to that, but it does give you a good excuse to drink! Anyway, I’m getting a bit too technical here. Like any wines, you have to try them to see what you like. Natural wines taste different from normal wines and sometimes taste different from bottle to bottle, so you just have to try them. My favoured white is the Domaine du Moulin ‘La Bodice’, my favored red is the Mortiers, and if you like ciders then you have to try the Poire. When I hosted my first LoveBites Dinner Party at TBLS, I wanted it to not only be a party with focus on the food, but also on the wines, which were all provided by La Cabane. If you let them know your menu, they are happy to sit down with you and discuss pairing the wine with the food. They also offer a 5% discount for 12 bottle 75cl or 6 Magnum 1.5L, or 10% discount for 24 bottles 75cl or 12 magnum 1.5L. 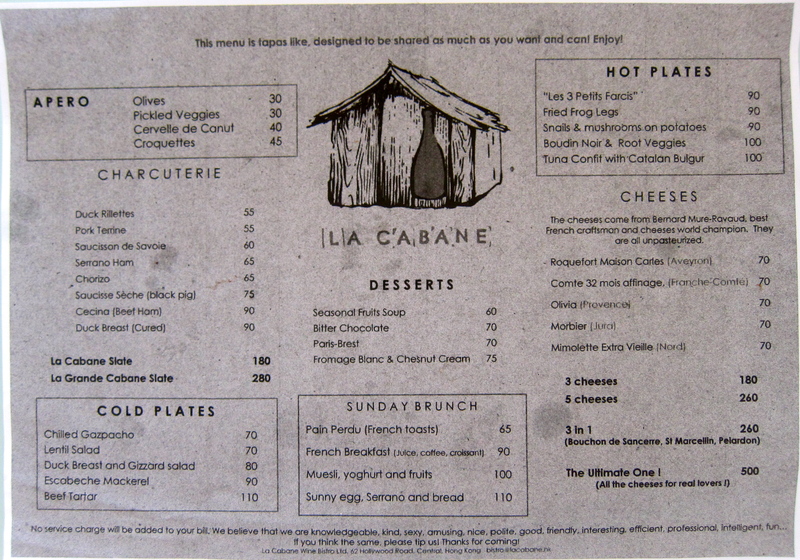 Note: La Cabane does not add 10% service charge, so you can tip as you see fit! This place looks so cute. Love the decor!